HTC Vive Virtual Reality Headset, with VR Base Station Stands is rated 5.0 out of 5 by 6. Rated 5 out of 5 by SamKebab from Great VR experience Following receiving this headset I was quickly able to set it up in a way suitable for the limited play space I have. I bought this originally for DCS World and other similar Sims to play seated with a HOTAS etc or a steering wheel. Since that I have bought many other titles and I have to say I cannot get enough! The drop in quality can put some off, but the immersion on simulation games is unparalleled and makes it that much better. Great load of fun on everything else. The headset seems sturdy and very comfortable. I would say it is nearly worth the money but believe the price point should be lowered to compete with the other headsets on the market. Only issue I have had so far is the extremely terrible way of updating the firmware for the base stations, if not done correctly (which is very easy to do) it can cause you to have to flash it manually. Rated 5 out of 5 by Beebs from Brilliant Fun I ordered the entire HTC Vive with TP Cast and delux headstrap with only a few days to go before Christmas! It arrived the following day!! We have enjoyed a great Christmas with a fantastic VR system. The quality is amazing with fantastic machines adapters that allow the sensors to easily fit to the stands. The service was fantastic from scan. Rated 5 out of 5 by RickJH from Amazing Absolutely fantastic, 1st class service from Scan as expected - delivery was so fast. Took advantage of the new price drop so I invested in the deluxe audio strap at the same time as it was within my original budget planned for the old price of the headset. Mind blowing virtual experience, whole new environment to learn & discover. I am a flight sim fan so I have downloaded Warthunder as it's free & supports VR. This blew me away & was the first time I experienced a little motion sickness but you get used to it - absolutely brilliant. Google earth VR is truly amazing too & I have since visited & saved most of the places I have visited in the world. A truly awesome piece of kit. I do however have a small office so most of my experiences are sat down so I have pre-ordered the TPCAST wireless adapter so I can use it in a larger room. Really looking forward to that. Rated 5 out of 5 by Pix16 from This kit is astounding. When I started looking for a VR system, I looked briefly at the Oculus Rift and Oculus Touch. However, with the inflated price tag and lack of compatible software due to it's more recent release, it was more money than I was willing to spend for what I would get. As such, the Vive does appear to be the best option on the market currently. When I put the headset on, I felt like I was in another world, the headset and controllers are tracked perfectly in almost all situations. I also discovered through accidentally hitting my stainless steel light fittings more times than I would like to admit, that the controllers are very durable. It's also worth noting that the HTC Vive comes with 4 free games that would otherwise cost around £20 each; with this, you're bound to get something good. Add on to that the amount of free Vive games on Steam that are often very good quality, and you get a more or less out of the box system that is definitely worth the money. There are, of course, some drawbacks; the hardware requirements are fairly reasonable but the space may be a problem for some. The Vive requires a minimum of 2m by 1.5m to function along with a fair amount of buffer space around that. You can configure the Vive to work with standing space only, which basically only requires that you be able to stand still and swing your arms around, though this will limit the games you can play. The kit provided by SCAN is good but I never did receive the thread adapters. This was, however, nothing some nuts, bolts and wall mount pipe clips wouldn't solve. Overall, I would definitely recommend this system, although I would also recommend checking that you can meet the requirements before buying. 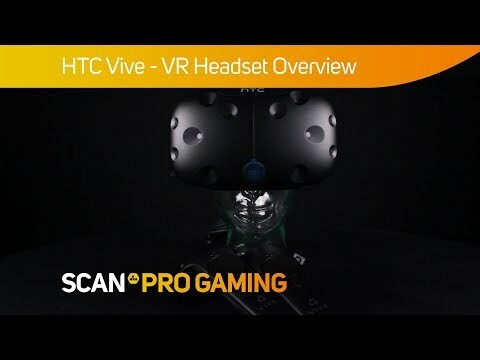 Is this the HTC Vive Eco or the standard one?